A senior at Penn Manor High School, Dani Warfel, believes she has chosen a good best friend, one that may have saved her life. Her best friend is able to give her advice to keep her safe. Even if she thinks about getting in a car with someone who is intoxicated, her best friend reminds her there are consequences. Warfel’s best friend went through her own experience of a death of a friend that was involved in a car crash. “She keeps me in line,” said Warfel. A best friend, or BFF, is important for any teen. In fact, some teens consider several friends as their BFFs. 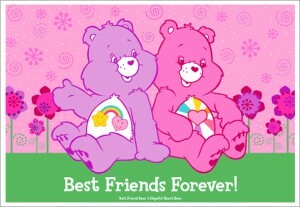 “It’s better to have a couple best friends then a whole bunch of friends that you’re not close to. In the end the couple best friends will be the ones you know the longest,” said senior Devin Yecker. In high school, choosing a best friend or group of them can be hard to do. Many high school students have learned that their best friends can have the best or worst advice and have an impact on their lives. From being able to share their life experiences to being able to help them get through the rough times, a best friend is important to nearly every teen. Sometimes being a teenager can make you feel disconnected from your parents or other adults. A best friend will listen to you express your feelings and concerns, and try to give you advice or help you solve problems. A best friend can better understand what’s going on in the teenage world. “Always do what makes you happy is the best advice I ever got,” stated senior Abby Newport. Best friends can influence the amount of trouble one gets into or stays out of. Best friends can even apply peer pressure on each other. “My best friend encourages me to do bad things,” said Danny Boehler, a senior at Penn Manor. Many times a friend will go along with what their best friend says because they trust their opinion. “My best friend gets me in trouble,” joked Newport. Being best friends has a level of responsibility built into it. Hopefully most BFF’s can give good advice to help their friend make good decisions. “They help me make wise decisions with right and wrong, and we go through the list of benefits and consequences before we do something,” said Reel. Best friends can also keep you accountable when you make a bad decision. “When I do something bad she gives me a lecture,” joked senior Devin Yecker. But the most important thing about disappointing a best friend, is their belief and encouragement that you will make a better decision the next time. “She doesn’t really get mad when I do something she doesn’t like, but she’ll give me a pep talk,” said Reel. You choose a best friend that shares common interests and values. Being a best friend, having a best friend or having a group of BFFs is a cornerstone of any teenager’s life. Having someone to share happiness or frustrations and give advice is what a best friend is all about.